Named for Fort Bowie, whose ruins are a designated Historic Site, Bowie came to life in 1880 through the combined efforts of the Southern and Pacific Railroad and frontiersman, James Tevis. 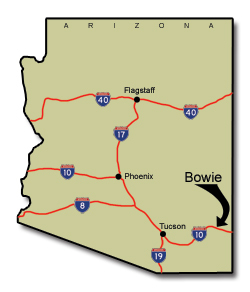 Bowie is surrounded by mountain ranges with 300 miles of hiking trails and cool pine, fir and spruce. Explore our website to learn more about the town of Bowie. "As I was taking my walk and rejoicing in this gorgeous late-October morning, I noticed four javelinas watching me from the adjacent vineyard. Through all my travels, this has always been 'my home'. I am so grateful to be living in this small high desert community surrounded by wildlife, mountains, trees, vineyards and, most of all, good people. We are proud of our area's rich heritage, steeped in colorful history. We have been survivors through ups and downs in its economy. Today as we begin to rebound again, I see the vision and resilience that has always lived here. WELCOME TO BOWIE!" The Chamber's letter to the community on our recent activities. Chambers in the Southeastern AZ Rural Chamber Alliance. The Bowie Chamber of Commerce Brochure.